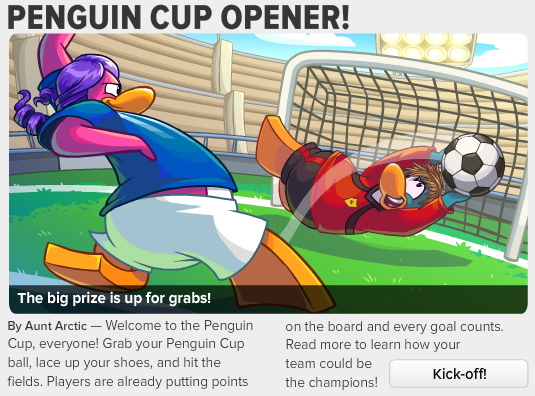 It's the opening of the Penguin Cup! It's time to play some soccer! Who's ready? First, Aunt Arctic gives us some tips on how to lead our team to victory. If you click 'Kick-off!' you will be able to read more. Be sure to read it because she gives some nice tips. Next, we have the team profiles. It kind of says a little bit about the style of the penguins on the teams. Check it out it's interesting. 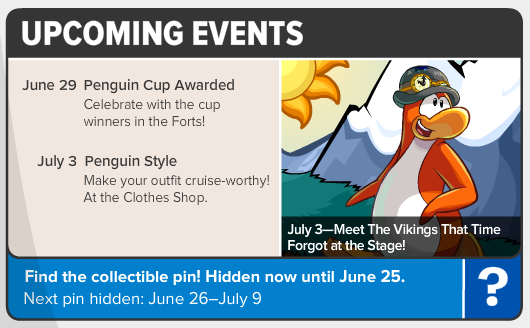 According to the Upcoming Events, the Penguin Cup team winners will be announced on June 29th. That's still in a long time so keep scoring goals!